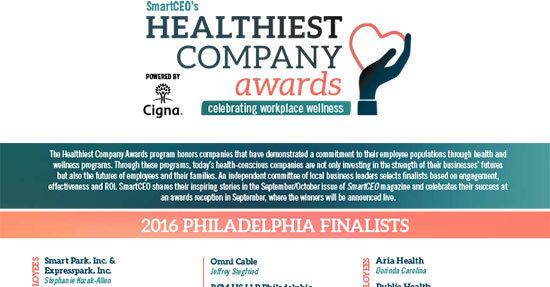 SmartCEO 2016 Healthiest Company Awards finalists | Smart Park, Inc.
« Smart Park RoboPark Automated Parking Robots effective April 1st! The Healthiest Company Awards program honors companies that have demonstrated a commitment to their employee populations through health and wellness programs. Through these programs, today’s health-conscious companies are not only investing in the strength of their businesses’ futures but also the futures of employees and their families. An independent committee of local business leaders selects finalists based on engagement, effectiveness and ROI. SmartCEO shares their inspiring stories in the September/October issue of SmartCEO magazine and celebrates their success at an awards reception in September, where the winners will be announced live. Expresspark believes that having Happy and Healthy Employees is critical to the success of our business. Click to read more about this honor in the SmartCEO Press Release.